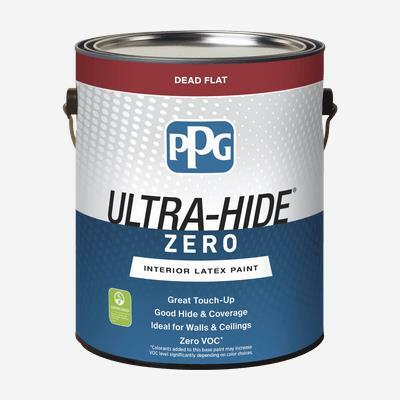 ULTRA-HIDE® Zero Interior Latex Paint is a durable, professional quality interior paint designed for new and repaint applications where speed of application is most important. Ideal for maintenance and facility management, this zero VOC*, low odor paint enables a space to be painted while occupied while delivering the durability that is required. Available in Dead Flat, Eggshell, Satin and Semi-Gloss, this product provides an excellent finished appearance for your interior projects. COVERAGE: Apply at 350-400 sq. ft. (32.5-37.2 sq. meters) per U.S. gallon (3.78 Liters) on primed, smooth, nonporous surfaces.